Tinderbox 5.7.0 is now available. First, Tinderbox Timelines make the leap to the Web. A new button in Timeline View generates HTML snippets that you can paste into blogs and Web pages, much as people do with YouTube videos. The mechanism is fast and easy, there are no additional files to edit and upload, and you have lots of options for controlling how the timelines look. Sharable timelines provide new power for journalism, scholarship, and study. Timelines are also a terrific planning tool for allocating resources or scheduling milestones. Now that timelines can move so easily to the Web, you can update your plans and share the results in seconds — even with people using iPads, phones, and Windows machines. Tinderbox has buckets of new functions for managing colors, dates, and strings to give you lots more flexibility while making your actions simpler and more direct. Upgrades are free if you bought Tinderbox in the past year. Upgrade from any previous version for $98. We’ll have more news shortly. 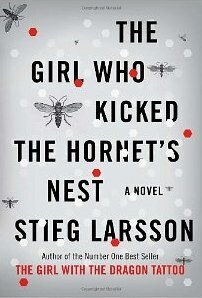 A rollicking good time and final bow for Lisbeth Salander and Mikael Blomkvist, this novel sorts out the chaos in which The Girl Who Played With Fire ends and delightfully weaves the loose ends into a lovely bow. Amongst the numerous plot threads, we again have a fine workplace drama as Erika Berger takes the helm of a large but troubled newspaper and finds that her staff is not as welcoming as one might hope, and the management even worse than one might fear. 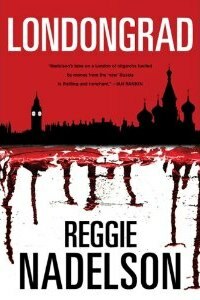 The center of the story, however, is the unequal combat between our intrepid band of underground journalists and the shadowy, off-the-books government department that has been running Swedish covert intelligence for decades and which turns out to be the most catastrophically inept spy service since John Le Carre’s The Looking Glass War . Considering our experience of the Bush years – not to mention the collapse of the Eastern European satellites – we’re surprisingly short of thrillers in which amateurs conduct espionage against the inept apparatus of state security. This once was treacherous ground because the obvious police state, Nazi Germany, fits uncomfortably in satire. You could (almost) write Hogan’s Heroes in 1965 but you couldn’t write it now; Catch-22 is hilarious, but we never see the Germans. But the Bushies? They would work just fine. Oliver Reichenstein of Information Architects (Japan) has an interesting discussion of a longstanding hypertext controversy: the conflict between the card sharks and the scrollers. Unfortunately, he gets the history completely wrong. Reichenstein’s belief that the people at Hypertext '87 were “neckbeards” is offensive. His account seems to rely entirely on the young Jakob Nielsen’s trip report; is Nielsen, that courtly Dane, a neckbeard? Doug Engelbart? Frank Halasz? Janet Walker? Randy Trigg? On this, Reichenstein has no idea what he’s talking about, he’s just making stuff up. Reichenstein thinks the scrollers won because “99% of all websites scroll.” That’s dandy (if true — has anyone measured? ), but it’s not the question at hand. What people were debating was whether following a link should take you to a new page — a “card” — or whether it should extend the text of the page you’re looking at right now. Nowadays, we call this stretchtext. You see it in weblogs that expand “There’s more…” in place, and you see it in exotic hypertexts for the Web. In 1987, many people thought the natural interpretation of clicking a link would be to expand the text in place. Peter J. Brown (University of Kent) had shipped GUIDE, a stretchtext system early that year, the first commercial hypertext tool for personal computers. Several other systems — Akscyn’s KMS (the US Navy was a big client) and Apple’s HyperCard – were pure card metaphor systems without provision for scrolling. Other tools, like Brown’s Intermedia, Bolter and Joyce’s Storyspace, Xerox PARC’s NoteCards, and Eastgate’s Hypergate, might scroll within the page but links took you to a new page. People used to worry that card metaphor systems (like the Web) would disorient readers. I gave lots of talks back then on the subject of The Craft Of Hypertext, and my recommendations were exactly opposite from Reichenstein. Card metaphor is ideal for highly nonlinear presentation, where the hypertext map is complex; that’s why I used it in The Election of 1912. Stretchtext naturally lends itself to annotative hypertext a nearly linear reading. That’s why people lost interest in stretchtext well before the Web appeared. At Hypertext 2009, I wrote a paper On Hypertext Narrative that explained for the first time precisely why stretchtext scrolling proved so limited, and how this can be fixed. A further issue in scrolling vs. card metaphor is latency – the time delay that accompanies link following. The personal computers of 1987 couldn’t do much page layout — running text around a float was considered a spectacular accomplishment — and many of these systems were running from floppy disks with seek times as long as your arm. The time needed to retrieve and format a new page could interminable. Brown University students used to bring a book to the computer lab so they could read while following a link, and on the USS Carl Vinson, sailors sometimes forgot what they had clicked before the new page appeared. Stretchtext, with simpler updating needs, seemed to promise a more responsive experience, making it easier to meet the requirement of Akscyn’s rule, that link traversal take about 250msec. (Ironically, we now live with Web latency much longer than Akscyn’s rule permits. But we don’t like it.) And since stretchtext preserves context, if you forgot what you clicked you can simply look and see it. So yes: the appropriate role of scrolling in hypertext is still not well understood, and the nature of link traversal is still open to exploration. But getting the history right is always desirable. They weren’t neckbeards, and even back in 1987 they were researching a more complex and important question than simply eliminating the scrollbar. One reason I really needed a Basil Smash yesterday was the developer twitter stream in the wake of yesterday’s Mac announcements. Apple’s going to host an App Store, the open sorcerors are fit to be tied, and lots of people are anxious. I think the Apple App Store will be a huge success, selling lots of entertainments and amusements and nifty conveniences to consumers. The newspapers will love it. It will make lots of money. That’s a good thing. Right now, there is no channel for $1 and $5 software. The software world has never had a decent dime store. There’s an audience willing to buy, if their fear of installation can be assuaged and if the channel costs can be kept in check. If you want to build a business in this direction, the app store should help. But it’s not going to be the only channel. A number of people – some of them usually sensible and sober – are frazzled by the prospect of the App Store becoming the only channel for software, either by corporate or by market fiat. This would be a disaster for Apple and (if alternatives could not be found) for civilization. It would be frightening. But there’s no reason to expect it to happen. Enterprise software doesn’t make sense for the app store. Its 30% margin covers mass distribution. Nobody’s going to give Apple a 30% cut of software transactions that run to six figures and require sales cycles in years. Business software can’t live with the App Store restrictions and doesn’t benefit from its curation. If you’re buying a game, you might like to know that Apple has checked it for obvious spyware. If you’re buying critical software for your business that will make you lots of money, you don’t want to wait for Apple’s permission, any more than Gimbel’s wanted to ask for Macy’s opinions on a new line of sweaters. Avant-garde software won’t be comfortable with the App Store review process, and the App Store reviewers are going to hate avant-garde software. Take us, for example. We’re planning Storyspace readers for iPad. It’s likely that someday an App Store reviewer is going to push the NEXT button and they’re going to find Michael Joyce’s afternoon, a story or Mary Kim Arnold’s “Lust” at the top of their pile. They’ll do a static scan and see naughty words in the code. They’ll look closer and see reviews in the New York Times and TLS and books and university courses. I expect that the next step in the Official Procedure will be to pound head on table. This sort of thing will come up again and again; it can be managed, but it’s never going to be beer and puppies. The App Store model works well for small impulse purchases (though I notice that it’s now proverbial that people who buy iPads on impulse will dither for days over spending 99 cents in the app store). It’s less good for big ticket items, especially third-party purchases. These raise all sorts of extra social and legal considerations; buying a car is not exactly like buying a cup of coffee. NeoVictorian software is going to be an awkward fit in the App Store. It’s hand made and the brush marks show; it can be tough for a critic to distinguish energetic brushwork from sloppiness. Artisanal software is crafted by people and for people who really need it – often for tasks that are challenging and hard to understand. We’re going to see more – not less – artisanal software in the next decade, because for the first time we’ll be able to make custom and semi-custom software that helps smart people do difficult things that need doing. Apple’s on a terrific roll. The App Store may well be a huge success. There’s a real chance that either the US or the EU, or both, will be getting serious about anti-trust enforcement in the wake of 2012 or 2016. I think Apple is already thinking about ways to have the weight of that blow, if it happens, fall on Google or Verizon or Pharma rather than on Apple. Locking down the dominant platform without the excuse of protecting the telecom network would be bating the bear. There is no need for Apple to control the entire channel, it’s never been their style, and every reason for them not to be seen to try. None of this is obscure or difficult to foresee. Apple is unlikely to miss any of these points, but large organizations are sometimes strangely blind. I can’t imagine that an organization would miss all of these issues, and all point to the importance of multiple flourishing software channels. So, teachable moment: we do need the freedom to write software and to use software that others create. We should take time, now and then, to imagine a UniComp world in which all software comes through one channel. But the App Store is not the herald of the software apocalypse. Keep calm and make stuff. The answer to last night’s “what shall we drink?” turned out to be a Basil Smash. This turns out to be a new cocktail, invented in Hamburg quite recently. I didn’t know that at the time; everything else we’ve been making in this cocktail expedition has been antique. You muddle some simple syrup, a bunch of basil, and some cut up lemons in the bottom of a shaker. Add ice and gin. Shake really well. Double-strain when pouring. This really is very good! Mine wasn’t nearly as green as the beauty shot at 365 cocktails, but the basil notes were prominent without being overwhelmingly grassy. I found it at Summit, which is well worth reading and which also features the red variant. A terrific use for some of the last of this summer’s basil, and perhaps a good reason to favor basil for the Aero crop. A fascinating thriller, wrapped in a police procedural and spiced with elements of Lawrence Bloch, early Le Carré, and Agatha Christie. Golden age plot elements (identical twins!) in a state-of-the-art plot and a spectrum of characters who are Russian without being Russian (and Jewish without being Jewish) and who, wherever they go, can never quite leave Moscow. Very fine work. Giles Turnbull reviews Twig for Cult of Mac. Twig is centered around a window called the Noter, and in use it reminds me a little of everyone’s favorite lightweight text notes tool, Notational Velocity. As you type into the note title box, Twig searches for matching notes and displays them. If if doesn’t find any, it creates a new one. That’s very NV-like. From there, Twig veers in the direction of its older sibling, Tinderbox. Notes can be re-arranged in a variety of views (chart, map, outline), and linked together. You can create prototype notes that hand on certain attributes to their children. Twig includes other Tinderbox features like agents (a bit like programmable searches), adornments, and search. Twig will open Tinderbox files, and vice versa. The theme of December’s Tinderbox Weekend is plotting and planning. There’s lots of interesting plotting in the air. 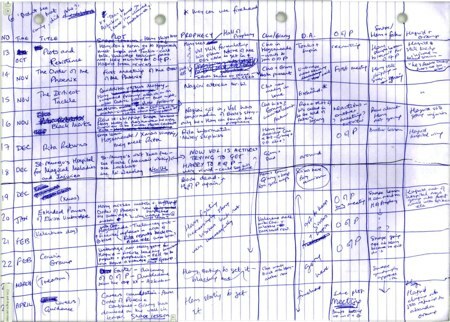 Via kottke, here’s a page of J.K. Rowling’s plot sketch. At Overthinking It, we have the nifty Female Character Flowchart, diagramming the taxonomy of stock female television characters from “Manic Pixie Dream Girl” to “Useless Girl”. Tinderbox timelines can help you reason about (and remember) constraints. For example, suppose you’re planning to make some widgets. You’re going to make some red, green, and blue widgets. When you start a different color of widget, you need to clean up and switch paint sources, and this takes and extra fifteen minutes. This timeline appears in browsers that support the canvas element. Now, if your manager wants you to do the blue widget right this minute, Tinderbox will automatically calculate when everything else will be started and finished. Obviously, reality is much more complicated than this. And if your business rules get too complicated, you want a full-scale scheduling package! But it’s nice to know you can automate this kind of business rule while retaining the flexibility and malleability of Tinderbox. Notice, too, that we can fit a small timeline into a small space. Timelines don’t need to be elaborate or complex to be useful, and since the next release Tinderbox will export them with a single click, you can include them whenever you like. 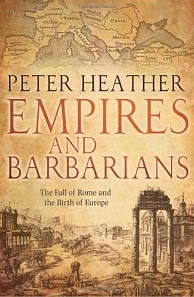 Heather’s wonderful The Fall of the Roman Empire serves as a prelude to this fascinating, thorough study of the end of Rome and the development of what came to be Europe. The idea of Europe as a continent or a trading zone is not dictated by geography and was, in point of fact, a very late development and, Heather argues convincingly, was by no means ordained by geography or demographics. Heather shows convincingly that the transition from late antiquity to the Medieval economy sharply reduced wealth inequality, ending a long dynamic of competition at the fringes of empire because the scale of economic development had ceased to be so starkly uneven. We know astonishingly little about the Barbarian peoples, either in terms of their history or their material culture. No one today has any idea what language the Huns spoke or just what they thought they were trying to do. No one really knows where the Russians came from, though the fact that "Rus" derives from the Finnish word for "Swede" is suggestive. The crucial fact of very late antiquity is the emergence of Slavic Europe in the East, but no one knows where the Slavs came from or how they lived and our memory of what must have been tumultuous events is limited to a few dim fables told about half-remembered missionaries. But Heather shows that the traditional notion that people did move is both plausible and probable; that Vandals left Germanic Europe to wind up in North Africa is far from unlikely in a world where we are quite certain that millions of Irish people left home for North America and millions of Rwandans left home for anywhere they could go. People leave when they must, or when opportunities seem vastly better in the developed world; in antiquity, that developed world was the Mediterranean economic zone. I've been toying further with the Tinderbox Timeline library. Here are some arbitrary events from the 19th century, rapidly sketched into a Tinderbox file and exported here. Don’t rely on these dates; this is a proof of concept, not scholarship. I took no care at all on the layout or color scheme; you could do better, and should. Thanks to Wikipedia and The Victorian Web. 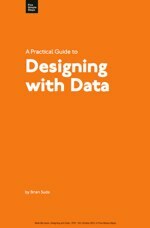 This nicely designed eBook (with optional paper edition) from Five Simple Steps surveys graphic design for graphs and charts. The overriding aesthetic is Tufte’s, with a strong flavor of High Modernism; Suda deplores chart junk and implores the designer to reduce visual noise and minimize the use of ink. The brand-new pdf does have a few mistakes (typos in the pdf’s table of contents, a damaged figure on page 26) but is otherwise a model of design. Suda considers his audience to be design professionals, and he assumes that design professionals are innumerate. This might be a safe assumption – the amount of hand-wringing in some design-heavy books when fourth-grade fractions are mentioned suggests Suda is not alone here – but I doubt that Suda approaches this in the best way. Chapter 4, in particular, says little more than “the golden ratio is good to keep in mind.” I doubt that the excursions into Fibonacci or irrational numbers will help a lot of people with this lesson. The extended discussion of color blindness is preaching to the choir; if you’re a design pro and you don’t know that some people are color blind, you haven’t been paying attention. Error bars are treated here as a gloss on bar charts. They’re just as important in line charts and scatter diagrams, and indeed in all sorts of visualizations. If there is one lesson designers need, it might be the importance of representing statistical uncertainty. Suda is deeply distrustful of new media. Dynamic graphs are excellent tools for exploring data, but if they canʼt be printed out or cast in metal, they wonʼt last. This is wrong: most data presentations, including those of greatest importance, are ephemeral. Reports and analyses, newspapers and journals, all are meant to inform, guide, and convince the reader and their immediate goal is to do their work, not to immortalize their creator. The most important virtue of the great posters of Cassandre or Toulouse-Lautrec was that they were effective as posters; whether or not they held up well over the years is a detail for curators. The fellow who designed the notorious slide where chartjunk partially obscured data that might have averted the Challenger explosion didn’t want his diagram to live forever, and would doubtless have been pleased if it had been understood, acted on, forgotten and lost to history. This is also a deeply conservative book that avoids many interesting problems. Why haven’t treemaps become more popular? Why aren’t sparklines ubiquitous? (I think one reason is that they look odd on the page, and that’s exactly the problem designers should tackle for us.) What’s happened to cone trees and information walls and the sort of visualization work that used to come so regularly out of PARC? Is there nothing more to say about textual visualization beyond word clusters and tag clouds? A very pressing concern today is representation in detail of large data sets – homeland security databases, social networks, the Web – where interaction seems essential because static summaries cannot anticipate our needs. Getting extraneous grid lines out of our graphs is a good thing, but there is a great deal more to be done. I’m beginning to reach for a jacket as I head out the door, and suddenly the idea of a Fall Dinner didn’t seem as forced as it did a couple of weeks ago. Lesson of the night: grilling the third course is far harder than grilling the first. Grill at the start of the night and it’s a general entertainment, watching the fire and sipping drinks. Grill in them middle and it’s one more thing to track. I really like the Pinot Grigio with the duck. I’ve been reaching for grenache and shiraz for confit, but this makes a lot of sense. I did try to avoid the food coma effect this time, sticking two the four course formula of Sunday Suppers and Lucques, a seldom-mentioned book from which I’ve learned a lot. Still too much food, I fear. But feasting is seasonal for autumn, right? 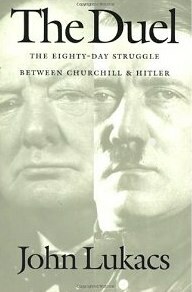 When Churchill assumed office on May 10, many observers expected England to capitulate and to become a Nazi satellite. Eighty days later, it was clear to all, including Hitler, England would never capitulate and would, in all likelihood, prevail. Yet nothing changed on the ground in this time, no battles were won, and in material terms England, unharmed in May, was by August battered by the blitz. Lukacs’ argument, originally stated in the brilliant Five Days In London and expanded here to the full eighty days, is that Churchill embodied the difference and that the force of the argument he propounded literally changed the world. An outcome that seemed reasonable in early May had, by May 10, been rejected forever by England’s government and, by August, what had seemed sensible and inevitable had become unthinkable because, in the end, Churchill would consider nothing else. Eliza Blair (Friends In Need) rediscovers a nifty poem about Little Red Riding Hood. See Red ride into battle. But Red was born in these valleys. I’ve been having a good time exploring cocktails lately. The cocktail worlds is an interesting intersection of the culinary and the literary, with lots of good writing and quite a bit of interesting flavor. Because everything is cold and wet, lots of dimensions of the experience are controlled and we really can focus on flavor. It’s interesting that we have three color receptors in our eyes, and everyone has words that correspond to red, green and blue. But we have five taste receptors, and while the words for four of these tastes are pretty common – sweet, sour, bitter, and salty – the fifth receptor, which detects umami or “meaty” flavor – is really known only in Japanese. The latest experiment was the 20th Century: gin, Lillet, lemon, and créme de cacao. I got the wrong créme de cacoa, and even though I dialed the chocolate way back, it was far too prominent. According to Twitter, Peter Merholz has been drinking Corpse Reviver #2, which replaces the chocolate with absinthe, and that’s probably a good thing if you happen to have absinthe, which I do not. 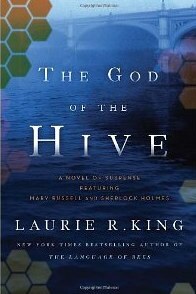 The latest installment in Laurie King’s wonderful series of stories about Mary Russell and her husband, Sherlock Holmes, this is in effect the second book of a two-volume story that begins with The Language of Bees. It’s great fun; after a long journey abroad (meeting the grown-up Kim in India, meeting the young Hammett in San Francisco) we’re back in London. Any extended family that includes Mycroft Holmes is bound is lead to an interesting collection of fuddlements, and this volume fuddles very satisfactorily. At times the plotting seems forced – plotting has never been King’s strong point – but the dialog offers its customary delights.